This is a royal wine museum that is situated inside the Duke’s Residence where he lived till the 16th century. This museum is solely dedicated towards wine and wine making techniques from the past till date. They have a wide range of tools and machines used in the wine making process apart from the wine tapestries. The old wine presses are another notable collection here. How popular is Musee Du Vin De Bourgogne? People normally club together Chateau De Pommard and La Moutarderie Fallot while planning their visit to Musee Du Vin De Bourgogne. Interesting Barn of old winery equipment. The.main Museum closed early so we didn't get to tour. The development of wine making is explained perfectly, unfortunately most information is in French. Museum is kind of boring, but ok when bought together with the hospice de Beaune. One of the best wineries I ever visited. The wines of this regions are fabolous, but Portugal has better ones, in spite of being less known. Self guided tour of regional wine making with open bottles of wine just sitting out to sip at each station where you read from a board (multi lingual). If you are genuinely interested in wine, the museum is a must-see while in Beaune. You can see the different types of historical wooden presses outside for free (very impressive and very labour-intensive!). 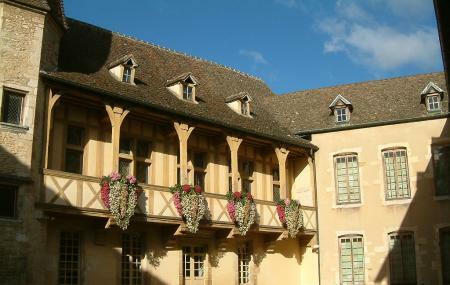 The museum has many rooms, each devoted to a different theme - ancient times, terroir & climats of Bourgogne, cooperage, harvest time (old equipment), a Nez du Vin room, the Hospices de Beaune actions and wine-related art. The only difficulty with the museum for non-French speakers is that most of the descriptions throughout the museum are only in French (with a few in English also). The online reviews were not promising but we decided to go anyway. Well worth the visit!